Since Facebook's May 18 debut, the company and its founder Mark Zuckerberg have failed to impress investors. NEW YORK (CNNMoney) -- Facebook's shares plummeted to all-time lows in after hours trading after the company's first quarterly earnings report failed to wow investors. Shares of Facebook (FB) fell more than 10% to around $24 -- nearly 40% below the company's initial public offering price. Facebook did beat analysts' revenues expectations slightly and earnings matched forecasts, but that was apparently not enough for Wall Street. Behind the numbers: Facebook is still posting strong growth. It generated $1.18 billion in second quarter revenues, up 32% from a year ago. And while Facebook reported a net loss of $157 million due mainly to $1.3 billion in compensation expenses tied to stock-based pay following the IPO, the company did generate a profit of 12 cents per share when excluding those costs. Analysts were expecting sales of $1.15 billion and earnings (backing out the compensation charges) of 12 cents per share. Zuckerberg addresses concerns: CEO Mark Zuckerberg highlighted the company's investment in research and development as a positive. "Our goal is to help every person stay connected and every product they use be a great social experience," Zuckerberg said in a release. "That's why we're so focused on investing in our priorities of mobile, platform and social ads to help people have these experiences with their friends." But with total expenses nearly quadrupling from a year ago, some investors may be worried that Facebook is spending too much -- even though the company finished the quarter with more than $10 billion in cash. Since Facebook debuted on May 18, there have been many doubts about the company's ability to find new ways to generate more revenue from its 955 million users. There are also increasing concerns about competition from Google (GOOG, Fortune 500) and others. Zuckerberg, who surprised some investors by showing up on the company's conference call with analysts Thursday, started the call by addressing how Facebook would build on its mobile platform. The company has been criticized for not doing enough to adapt to the growing shift among its users. More are starting to access Facebook on their smartphones in addition to (and sometimes instead of) PCs. 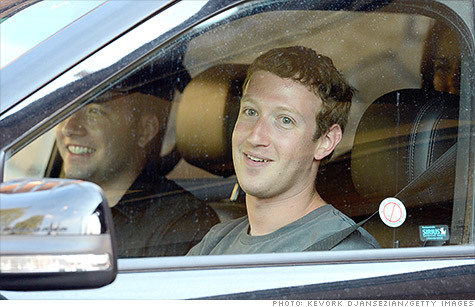 Zuckerberg said mobile is among the company's top priorities. He said Facebook is starting to figure out how to generate revenue from mobile ads. He also noted that by the end of June Facebook generated $1 million per day from its new sponsored stories from advertisers. And half of that, Zuckerberg said, came from mobile ads. "It's an encouraging start," he said. Facebook chief operating officer Sheryl Sandberg added that sponsored stories were the "cornerstone of mobile monetization strategy" for the company. But the company disappointed analysts by failing to give any revenue or earnings guidance for the next quarter or rest of the year. During the conference call, Facebook chief financial officer David Ebersman said the big priority for the company is sponsored stories within Facebook's News Feed. Ebersman noted that it's "difficult" to forecast what Facebook could make from these ads since the company didn't really begin to aggressively use them until June. Absent forecasts, investors didn't appear to buy into the bold promises both Sandberg and Zuckerberg repeatedly made for these news methods of advertising and associated revenue growth. Sandberg admitted that Facebook could have a long road ahead of it in convincing advertisers how to sell products on its site. "We'll be able to educate the market over time. How quickly that will happen will depend," she said. Meanwhile Zuckerberg said acquisitions going forward will be mainly to acquire new engineering talent, and repeated his earlier statement that Facebook is unlikely to make another big product acquisition similar to its $1 billion buyout of Instagram. "We have this entrepreneurial culture where we want the type of people inside the company who take risks and be the type of people who build out companies on their own," Zuckerberg said on the call. Buying up startups makes it easier to acquire these type of employees, he said. Tough times for social media: Investors had become more nervous about Facebook's results Wednesday night, after social gaming company Zynga (ZNGA), a source of 15% of Facebook's first quarter revenues, reported earnings that missed forecasts and lowered its outlook. Zynga's stock plunged nearly 40% Thursday and Facebook fell more than 8%. It's been a rough few months for the most hyped social media companies. Shares of Pandora (P) and Groupon (GRPN) are down 41% and 67% since their IPOs. But LinkedIn (LNKD), which preceded the others to the public markets, is one of the few social media companies that has been a hit on Wall Street. LinkedIn's stock has more than doubled since its IPO in May 2011. Meanwhile, Apple's (AAPL, Fortune 500) results this week gave investors another reason to question whether even the best technology companies are starting to feel the effects of a sluggish global economy. Apple's earnings missed forecasts and the iPhone and iPad maker also issued guidance that was lower than expected.